Hi, my name is Cliff McTavish, I am the owner and operator of Vitality Centre. I am a registered massage therapist Saskatoon based, with locations also in Borden and Langham. I have been a registered massage therapist for over 20 years! 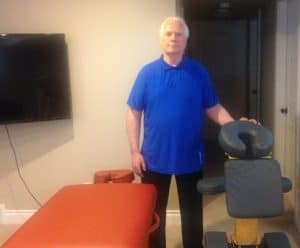 In owning my own business for the past 12 years as well as co-owning the Bow Valley Massage Clinic in Calgary for 8 years prior to that, I feel that I have been able to bring a lot of experience to my clients both in Saskatchewan and Alberta. My past experience in volunteering as the chair of the MTAA Examination Committee and also contributing my time when possible to association events, has allowed me to expand my knowledge in the areas of pain and stress management. Over my past 20 years experience I have focused on specializing in pain and stress management. My vision is to be able to assist my clients in the prevention and rehabilitation of physical and emotional pain through offering them therapeutic massage with trigger point therapy and other products & services that focus on pain management and stress reduction. I also have a focus on toxin elimination as I feel that the use of infrared saunas can help to eliminate the build up of toxins in the body, therefore I also sell infrared saunas. Please see our infrared sauna page for more information. At Vitality Centre our focus is on relaxation, pain relief, stress reduction and toxin elimination. Clients can receive therapeutic massage, trigger point therapy and chair massage, all in a comfortable, safe and relaxing environment. I am a certified and registered massage therapist Saskatoon based, with locations also in Borden and Langham and a member in good standing with the MTAS (Massage Therapy Association of Saskatchewan). I work in 3 locations, Saskatoon, Borden and Langham. I welcome DVA, Insurance, and MVA, SGI claims. Did you know that a lot of companies will pay for massage therapy as a form of reducing stress in the workplace? Check with your company to see if this is an option for you! ♥Outside Saskatoon please fill out the Contact Us form for infrared sauna information and we will contact you as soon as possible.